This week has seen the first proper meeting of the Asia-Pacific Partnership for Clean Development and Climate (APP). ConservativeHome will provide more information on the APP in coming days but two reports (here and here) give a taste of its ambitions. The APP is strongly backed by the world's two most successful conservative leaders - George W Bush and John Howard. They believe that environmental problems will only be solved by technologies that provide clean development. They do not believe that developing nations will ever sign up to a Kyoto-style accord so long as it requires emmission cuts regardless of technological progress. 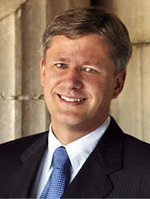 Canada's likely next Prime Minister, Tory Stephen Harper (pictured), seems set to join the ranks of the Kyoto-sceptics. This will leave David Cameron somewhat isolated within the conservative community for his enthusiastic support of Kyoto-style environmentalism. Canada provides a good example of the hypocrisy of the Kyoto signatories. Canada's existing liberal government has pilloried America for not signing up to Kyoto but Canada's emmissions have risen twice as fast as American levels. We already know that most EU nations are struggling to meet their Kyoto targets (targets that by themselves will do very little to address global warming). They are struggling despite the fact that they have exported much industrial capacity to developing nations. The demise of Britain's coal industry is a leading explanation for our own stand-out performance on Kyoto. Somewhat isolated in the conservative community but somewhat in the majority in the international community. It seems just like yesterday when George Bush was isolated. Good effort Editor at trying to influence the agenda. With limited success I suspect. Kyoto has always been a one-sided arrangement: Putting strict rules on the already environmentally-conscious West, while allowing the third world nations with horrific pollution standards to continue polluting and to even expand their pollution-spewing industries with impugnity. It's high time for some scepticism and some honesty about Kyoto. But the answer is to fix Kyoto to represent global realities and to address future pollution problems before they emerge, not join in with the mindless, unthinking eco-radicals who spew slogans like Chinese factories spew pollution. "This will leave David Cameron somewhat isolated within the conservative community"
Surely the environment is an area where the 'and' theory would be ideal in marrying two strands of thought together - cut carbon emissions AND develop technology-based solutions. I don't think it should be a case of either/or. It's interesting to compare the targets for the Kyoto signatory nations and their actual achievements. A cynic might say that they signed up just to appear "green". Our editor is right to point out that even if they had made their target, the effect on global warming would be practically insignificant. Even Tony Blair has woken up to reality. Reducing CO2 emissions can only be achieved by improved technology, not by trying to get people to cut their standard of living. Mind you this will only stem the tide of CO2 increases, as the relentless growth of industry in India and China march on. Politicians who talk the talk of Kyoto are just in the business of gesture politics. The pain required for cuts will not be palatable. The writer's assuming David Cameron is part of the Conservative Community? "The writer's assuming David Cameron is part of the Conservative Community?" What a very silly thing to think. DVA: "Surely the environment is an area where the 'and' theory would be ideal in marrying two strands of thought together - cut carbon emissions AND develop technology-based solutions. I don't think it should be a case of either/or." Absolutely right, Daniel. They are mutually dependent. Mr Ed: "We already know that most EU nations are struggling to meet their Kyoto targets (targets that by themselves will do very little to address global warming)." That is an argument for stronger enforcement mechanisms not no enforcement mechanisms. Does insufficient progress toward global free trade mean that the WTO should be scrapped? "The APP is strongly backed by the world's two most successful conservative leaders - George W Bush and John Howard. They believe that environmental problems will only be solved by technologies that provide clean development." Actually, John Howard has unilaterally committed Australia to the same carbon reduction targets as it would have had as a Kyoto signatory. As for the US, Bush will soon be history. His most likely successor John McCain takes a very different line. So assuming that what you say about Harper is true, David Cameron has a choice between aligning the UK with the most of the western world or with, er, Canada. By the way you don't have to speak English to be a conservative. Mr Ed "The demise of Britain's coal industry is a leading explanation for our own stand-out performance on Kyoto." I think you mean the shift from coal to gas fired power. Not quite the same thing. In any case the biggest contributor to our lower carbon intensity is energy efficiency. As long as Cameron ditches Zac G's views on nuclear then his isolation in the conservative community can come to an end when he allies himself with Iran. His 'conservative isolation' as you say ed would then come to an end! While somewhat tangential, I suppose this would also be the opportune momnent to wish Stephen Harper the best of luck: both in winning the upcoming election, and then in doing all that needs to be done to clean up Canada after years of being mired in the Liberals' cesspool of corruption. Never really understood why people so opposed to the need for reducing carbon emissions are so keen on nuclear power. People who oppose nuclear power are not all nutters - just risk averse, and with good reason. The nuclear industry does not have a good safety record. Daniel Vince-Archer: We need to develop the technology so that emmissions can be reduced in a way that is consistent with the developing world's legitimate ambitions for growth (and the social benefits that that growth brings their unhealthy, impoverished citizens). It's more the THEN theory than the AND theory on this occasion. Develop the clean technologies and THEN make sustainable environmental AND economic progress. Peter Franklin: I'm disappointed to see your real red colours emerging from your green plumage. For "stronger enforcement mechanisms" read "growth caps"... at least until the necessary tech has been developed. Even if he becomes President, McCain will not convince Congress to pass this stuff. There's a lot of opposition amongst industrial state Democrats - let alone Republicans. As likely to become GOP candidate/ President is Governor Mitt Romney. Romney opposes Kyoto and has just pulled his state out of the North Eastern States' Global Warming Accord. Is Israel a member of Kyoto? Editor, if McCain is as only as likely as Romney to become President, then that's a relief to me, because as much as I as a lonely stalwart of the GOP here in Massachusetts generally like Mitt, I doubt he has a snowball's chance in Hell, and since I absolutely despise John McCain and all his works (see my last blog post for just a little taste of why), then I'm happy you agree his chances are slim. I like Giuliani's chances (and I'd back him to the hilt), or if Rudy doesn't run, George Allen. Mr Ed: "I'm disappointed to see your real red colours emerging from your green plumage. For "stronger enforcement mechanisms" read "growth caps"... at least until the necessary tech has been developed." There's nothing red about stronger enforcement mechanisms -- the WTO has some very strong enforcement mechanisms, which is why it has had more success ensuring compliance and even-handedness than most international treaties. Also, you continually make the assertion that we have to wait until the right technology becomes affordable. No we don't. Energy efficiency is already affordable, indeed we can't afford not to implement it. Shamefully, some of the US anti-Kyoto think tanks have put a lot of money into campaigning against it. Now I'm off to find my McCain '08 badge or 'button' as our American cousins would say. "Daniel Vince-Archer: We need to develop the technology so that emmissions can be reduced in a way that is consistent with the developing world's legitimate ambitions for growth (and the social benefits that that growth brings their unhealthy, impoverished citizens). It's more the THEN theory than the AND theory on this occasion. Develop the clean technologies and THEN make sustainable environmental AND economic progress." Well no doubt I'll be painted as a sandal-wearing, lentil-eating greeny for saying this but we need to start addressing serious environmental issues now. This means implementing a harm reduction strategy, such as Kyoto (although I am by no means suggesting that Kyoto is perfect or that it should be adopted unconditionally), now and reviewing that strategy as clean technological solutions become available and affordable, in order that the impact of such solutions can be maximised, rather than restricted to developed economies and denied to the developing economies you are rightly concerned about. By no means am I arguing that developing economies should not be allowed to develop, but I do think that such development should be responsible and sustainable, which has not been the case so far. I'd also have to partially quibble with your point about the social benefits of growth for impoverished, unhealthy citizens. - such shanty towns are also noted for a lack of access to education, which coupled with the shortage of jobs, contributes to both booming 'black-market employment' and soaring crime rates, both in the shanty towns and the city beyond. In short, for many citizens in developing economies, economic development does not serve to alleviate poverty and poor health, but actually has adverse social effects which serve to exacerbate poverty and poor health. To argue that efforts to control climate change must be put on the back burner (so to speak!) in order not to stiffle the developmental aspirations of the Third World is outrageous. There are many things that aid economic growth - virtual slave labour (see Burma), the ability to use totalitarian diktat to clear land for factories (see Malaysia), total disregard for health and safety (see China) and corrupt pay offs to officials who might otherwise levy local taxes to improve the quality of life for communities (see India). In the West, the industrial revolution had all of these features, in some place and at some times. We banished them (for the most part). Now, our Editor claims to believe in an ethical foreign policy. So surely he doesn't think that we in the West should accept "well, you used to do it" as an excuse for bad behaviour from Third World nations. Either these countries should develop in accordance with contemporary standards of behaviour or they shouldn't develop at all. Previous generations didn't know any better - we have no excuse, wherever we live. 90% of Britain used to be covered in trees. We cut them down. Should we turn a blind eye while Indonesia and Brazil do the same? (and, please, no quotes from that German junk science report about methane). Let's go hell for leather to develop new technologies but, until we do, let's do what we have to in EVERY part of the planet to curb harmful emissions. In many of the worlds poorest countries they are already pretty green regarding emissions - wood, charcoal are main cooking/heating fuels and much use is made of hydro-electric and even solar for the limited power produced. Its those "second world" countries with high populations and reasonable education - China, India, Indonesia, Malaysia etc - that we need to bring into the fold. That's where technology can help - efficiency of gas in electricity production owes much to US investment. We can't say to them stay poor - we need to get them involved in the use of greener alternatives. DVA: You describe lots of things that are 'growing pains' but surely it is for the developing nations themselves to decide whether they want growth and its consequences? - not for us to demand that they can't consume the levels of energy that they need for growth and all of its benefits. Britain wouldn't be the country it is now if Luddites had had their way and persuaded their contemporaries that the transitory costs of industrialisation wouldn't one day be worthwhile. ToryT: Your arguments come perilously close to saying that the developing world needs to give up the prospects of growth for the sake of the planet. If the west isn't willing to give up its luxuries it should not deny the prospect of betterment to the developing world's undernourished, undereducated and undermedicalised. If Kyoto was delivering real benefits your arguments might be worthwhile. If full implementation of Kyoto would stop global warming it might be worth the cost. But Kyoto won't save the planet even if it was being implemented - which it isn't. If you believe that global warming is real the only hope is tech progress. Peter Franklin is right to stress the value of energy efficiency (good for the household budget AND the environment!) but only clean technologies will address the challenge of the developing world's impact on the environment. "DVA: You describe lots of things that are 'growing pains' but surely it is for the developing nations themselves to decide whether they want growth and its consequences? - not for us to demand that they can't consume the levels of energy that they need for growth and all of its benefits. Britain wouldn't be the country it is now if Luddites had had their way and persuaded their contemporaries that the transitory costs of industrialisation wouldn't one day be worthwhile." I'm not arguing against growth, I'm arguing that growth should be managed in a responsible and sustainable manner, which I'm afraid to say, has not been the case so far. It makes my blood boil to read arguments along the lines of 'it's not fair to tell China and India they need to curb their emissions as they're developing countries and need to help their people out of poverty' when China is spending billions on a space programme whilst baby girls are left to die because the Chinese economy can't sustain its population and India is pumping a small fortune into a nuclear weapons programme whilst street children in Mumbai have to resort to scavenging through rubbish to try and scrape together enough of a meal just to stay alive. As somebody who believes so strongly in social justice, I find your no pain, no gain, Majoresque 'yes it hurt, yes it worked' stance on the environment, society and development completely unfathomable and more than a little disappointing. DVA: You make good points about how China and India misuse some 'proceeds of growth' (to coin a phrase) but my fundamental point is still valid. Growth will be the only long-term way the Chinese people will get better healthcare and the Indian slums will be cleared. We're agreed that development should be clean. Where we still appear to disagree is that I think the emphasis should be on developing clean technologies as a matter of urgency - you appear to prefer environmental growth caps now regardless of technology. I note you don't address my points about the failure of Europe to fulfil its modest Kyoto targets. We can't expect development-hungry countries to make big sacrifices if we in the rich west can't make meagre sacrifices. "DVA: You make good points about how China and India misuse some 'proceeds of growth' (to coin a phrase) but my fundamental point is still valid. Growth will be the only long-term way the Chinese people will get better healthcare and the Indian slums will be cleared. We're agreed that development should be clean. Where we still appear to disagree is that I think the emphasis should be on developing clean technologies as a matter of urgency - you appear to prefer environmental growth caps now regardless of technology." Again, I'm not arguing against growth, I'm just arguing that growth should not be allowed to override all other concerns. I agree that we need to pursue clean technologies as a matter of urgency, but until such technologies become available and affordable, there is a need for to implement a harm reduction strategy, which can be reviewed as green technological solutions come on-stream. Thus, to say I prefer environmental growth caps regardless of technology is a misrepresentation of my position - and unlike you, I don't see the two as mutually exclusive, I think that the two are mutually supportive (clean technology leads to reduced emissions and reduced emissions encourage development of clean technology). "I note you don't address my points about the failure of Europe to fulfil its modest Kyoto targets. We can't expect development-hungry countries to make big sacrifices if we in the rich west can't make meagre sacrifices." I didn't address this point because I largely agree with it - I find it lamentable that Europe is not meeting its targets and that we're not in the best position to lecture other countries if we can't keep our own house in order. I'm with the Copenhagen Consensus in believing that there are better ways of helping the world's poor today than acting against global warming today. Liberalised trade and action against malaria being two better things to do now according to their rankings. When the technology is available we should address global warming. To do so now with immature technologies is not a good use of scarce resources. I've enjoyed our exchange, Daniel. While tending to agree with you on Copenhagen Consensus the article in todays Independent is scary if true - is it already too late? Should we be planning for a hot UK? Good selling point for technological advance - improved performance, better fuel consumption and reduced CO2.